Las Vegas is the most populated city in the State of Nevada and is the largest city in the Greater Mojave Desert. Spanish explorers discovered this area in 1829. Las Vegas in Spanish means “The Meadows.” It served as a watering place for travelers journeying to South California. The arrival of the railroad in 1905 brought in more settlers to this place. However, it was only in 1931, that Las Vegas really started flourishing, when the Nevada Government legalized gambling to bring in more money and improve the state’s condition after The Great Depression. The construction of Hoover Dam also helped the state's economy. 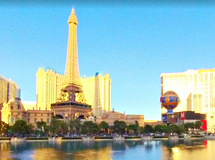 Las Vegas is popularly known as the “Entertainment Capital of the World,” and is extremely popular globally for its world-class mega casino-hotels and associated activities. Other popular nicknames related to gambling as well as easy marriage and divorce laws in Las Vegas are "The Gambling Capital of the World," "Capital of Second Chances," "The Marriage Capital of the World," "The Silver City," "America's Playground," “Sin City,” and “City of Lights.” This is one of the major resort cities in the world which offers a very fine experience of gambling, shopping, fine dining, nightlife, and entertainment. Tourism is the biggest employer in this city which is a cultural, financial, and commercial center of Nevada. Some important and must-see places and things to do in Las Vegas are the Las Vegas Strip, Fremont Street Experience, Paris Hotel and the Eiffel Tower, Bellagio Resort and Fountain Show, Venetian Hotel and Gondola Rides, Mandalay Bay and the Shark Reef Aquarium, Mirage Hotel: Erupting Volcano and Secret Garden, Caesar's Palace and The Colosseum, Vegas Indoor Skydiving, Luxor Hotel, High Roller Ferris Wheel on the Linq, Stratosphere Tower, Excalibur Hotel, Helicopter Rides over Las Vegas and the Grand Canyon, MGM Grand Hotel and CSI, Madame Tussaud's, Las Vegas Monorail, Las Vegas Motor Speedway, Las Vegas Natural History Museum, etc. Las Vegas also has a high concentration of wholesale and retail precious metal dealers who sell all types of coins, currency, stamps, postcards, antiques, jewelry, and other collectibles. It would be a good place to find something unique and rare to take back as a souvenir. Please remember that the State of Nevada levies a minimum sales tax of 6.85% on the sales of any gold, silver, platinum, and other precious metal coins whose actual value exceeds by more than 50% of its face value. This tax varies, the lowest sales tax is 6.85% and the highest bullion sales tax is 8.1% in Clark County and Las Vegas. Being an out of state retailer, Bullion Exchanges does not charge sales taxes on any purchases made by Nevada residents. However, it is always better to check with a tax professional before making any purchase, as we are no tax policy experts. 1. Justin Gomes Coins Address: P.O. Box 12336, Las Vegas, NV 89112 Phone number 702-454-3482 Services: Wholesale, Retail, Auctions, Buying and Estate Liquidation, Appraisals, and Newsletter. Specialties: US Coins, Dollars, Gold Coins, 19th Century Silver Coins, Early Type, 20th Century Coins, Commemoratives, Modern Coins, Early Copper, Nickel Coinage, Small Cents, Patterns, Colonial Coins, Territorial Issues, Tokens/Medals, Mint Errors, World Coins, Bullion Coins, Ancient Coins, and Currency. 2. Mike Byers Inc. Address: PO Box 26807, LAS VEGAS, NV, 89126 Phone number 714-914-6415 Hours of Operation: Appointment Only Services: Collector Sales, Retail, Wholesale-to-the-Trade, Appraisals, Auctions, Buying and Estate Liquidation, and Newsletter. Specialties: US Coins, Dollars, Gold Coins, Early Type, 19th Century Silver Coins, Error Coins, 20th Century Coins, Territorial Issues, Patterns, Mint Errors, and World Coins. 3. Miller Numis. & Auction Serv. - USA Auctions Inc. Address: 3021 S Valley View #104, Las Vegas, NV 89102 Phone number 800-678-7204, 702-255-5532 Services: Wholesale, Retail, Auctions, Buying and Estate Liquidation, Appraisals, and Newsletter. Specialties: US Coins, Dollars, Gold Coins, 19th Century Silver Coins, Early Type, 20th Century Coins, Commemoratives, Modern Coins, Early Copper, Nickel Coinage, Small Cents, Patterns, Colonial Coins, Territorial Issues, Tokens/Medals, Mint Errors, World Coins, Bullion Coins, Ancient Coins, and Currency. 4. Sahara Coins, LLC Address: 7293 West Sahara Ave, Suite 106, Las Vegas, NV, 89117 Phone number 702-367-4360 Hours of Operation: Mon to Fri 9:30 am to 4:30 pm Sat 10 am to 2 pm Services: Wholesale, Retail, Auctions, Buying and Estate Liquidation, Appraisals, and Newsletter. Specialties: US Coins, Dollars, Gold Coins, 19th Century Silver Coins, Early Type, 20th Century Coins, Commemoratives, Modern Coins, Early Copper, Nickel Coinage, Small Cents, Patterns, Colonial Coins, Territorial Issues, Tokens/Medals, Mint Errors, World Coins, Bullion Coins, Ancient Coins, and Currency. Please find below a list of top coin and precious metals dealers in Las Vegas. 1. The Duke of Fremont Street - American Coin Collector Address: PO Box 81942, Las Vegas, Nevada 89180 Phone number 702-561-9431 Services: Collector Sales, Appraisals, and Wholesale-to-the-Trade. Specialties: Bullion Coins, Morgan and Peace Dollars, Gold Coins, and US Coins. 2. Coin & Currency of Nevada Address: 9620 Las Vegas Blvd S # N6, Las Vegas, NV 89123 Phone number 520-432-1880, 702-541-8844, 702-747-0000 Hours of Operation: Mon to Sun 10 am to 6 pm Services: Coin Dealers & Supplies. 3. DEI Numismatics Address: PO BOX 95517, Las Vegas, NV, 89193 Phone number 800-208-1810 Hours of Operation: 10 am to 7 pm Services: Assists Collectors with Submissions, Appraisals, and Wholesale-to-the-Trade. Specialties: Early US Type, Morgan and Peace Dollars, Gold Coins, and US Coins. 4. Mike Kragel Address: P.O. Box 30488, Las Vegas, NV, 89173 Phone number 417-569-0375 Services: Assists Collectors with Submissions, Appraisals, and Collector Sales. Specialties: Barber Coinage, US Coins, and Early US Type. 5. Las Vegas Coin Co LLC Address: 3864 Silvestri Ln, Las Vegas, NV 89120-3908 Phone number 702-812-8294 Services: Coin Dealers & Supplies. 6. Las Wages Jewelry and Coin Address: 193 E Warm Springs Rd., Suite 103, Las Vegas, NV, 89119 Phone number 702-586-3007 Hours of Operation: Mon to Fri 10 am to 7 pm, Sat to Sun 10 am to 5 pm Services: Appraisals, Auctions, Assists Collectors with Submissions, Collector Sales, Storefront, Helps Build NGC Registry Sets, and Wholesale-to-the-Trade. Specialties: Gold Coins, World Coins, and US Coins. 7. Vegas Stamps and Hobbies Inc. Address: 5643 W Charleston Blvd, Las Vegas, NV 89146 Phone number 702-381-5430 Hours of Operation: Tue to Sat 10 am to 4 pm Services: Coin Dealers & Supplies, Appraisal, Collectibles, Stamp Dealers, Time Stamps, and Hobby & Model Shops. Specialties: Rare Coins & Stamps, Antiques, Foreign Coins & Stamps, Used Coins & Stamps, Antique Stamps, and Stamps. 8. Rainbow Coins Address: 2550 S Rainbow Blvd Suite E19, Las Vegas, NV 89146 Phone number 702-749-3333 Hours of Operation: Mon to Sun 9 am to 6 pm Services: Coin Dealers & Supplies, Stamp Dealers, and Jewelers. 9. Ultimate Sports Cards and Memorabilia Address: 450 Fremont St #183, Las Vegas, NV 89101 Phone number 702-363-7999 Hours of Operation: Mon to Sun 11 am to 7 pm Services: Coin Dealers & Supplies, Sports Memorabilia, Sports Cards & Memorabilia, Antiques, Toy Stores, and Collectibles. 10. Archangel Coins Address: 594 S Decatur Blvd, Las Vegas, NV 89107 Phone number 702-683-2196 Services: Coin Dealers & Supplies. 11. Fantastic Coins Address: 1409 S Main St, Las Vegas, NV 89104 Phone number 702-412-5215 Hours of Operation: Mon to Sun 10 am to 6 pm Services: Diamond Buyers, Coin Dealers & Supplies, Diamonds, Precious Metals, and Gold, Silver & Platinum Buyers & Dealers. Specialties: US Coins, Rare Coins, Gold Coins, and Bullion Coins. 12. Ancient Creations Address: 1800 Industrial Rd Ste 200, Las Vegas, NV 89102 Phone number 88-382-8885, 702-940-2014, 702-907-9395 Services: Watches, Coin Dealers & Supplies, Gift Shops, Antiques, Online & Mail Order Shopping, and Jewelers. 13. Frank's Coin Shop Address: 2901 Las Vegas Blvd S, Las Vegas, NV 89109 Phone number 702-733-9798 Services: Collectibles, Coin Dealers & Supplies, and Stamp Dealers. 14. The Coinologist Ltd. Address: 10161 Park Run Dr., Las Vegas, NV 89145 Phone number 702-518-0218 Hours of Operation: Mon to Fri 10 am to 6 pm Services: Stamp Dealers and Coin Dealers & Supplies. 15. P & M Coin Address: 4301 E Bonanza Rd, Las Vegas, NV 89110 Phone number 702-452-5073, 702-452-5037 Services: Coin Dealers & Supplies.